This is a unique market, which takes place only only on Tuesday. 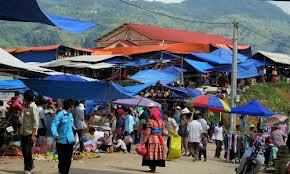 Coc Ly is a small market where you can meet several ethnic minorities such as Flower Hmong, Tay, Nung, Day, Phu La. The trip offers you a one-way boat trip along the beautiful Chay River. 08:00 Pick up at the lobby of the hotel in Hanoi transfer to Hanoi Railways Station for the night train to Lao Cai. Overnight on the train with soft sleeper berth. Your tour guide and driver will meet you at Lao Cai train station in the early morning, freshening up and enjoy breakfast at the local restaurant nearby. Then you will travel about an hour via rich farmland with lush fruit garden and tea farms, turn left to the tough road for 20km, passing some canyons, mountain passes and villages to Coc Ly Market. It is a rural market on every Tuesday. About 50km east from Lao Cai, the market lies on the bank of Chay River, surrounded by steep mountains covered with fabulous forest. To go to the market, minority people such as: Flower Hmong, Tay, Nung… from remote villages have to wake up early to walk up and downhill for hours. You can spend few hours joining the locals at the market for your own experience. 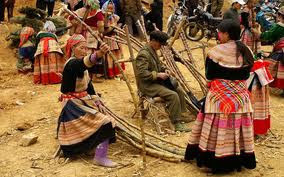 After that, you will board a sampan and follow the Chay River downstream for a discovery of wild nature and minority lifestyle in this “off beaten” track region. A long the river, we will stop to have a short walk about 1 hour to visit Trung Do village which is the home to Tay tribe before traveling by boat to the end of river to meet our driver and transfer to Sapa. You stay overnight at the hotel in Sapa. You have buffet breakfast at the hotel before traveling by car up to Sao Chua village, home of Black Hmong tribe where you start trek about 12km along the remote and quite route through beautiful mountainous area. Along the way, you will have many opportunities to enjoy the spectacular view over rice terraced and corn fields as well as experience the real things of Sapa because this area is non tourist along the way. You will take a break to have lunch at nice place along the way before trekking towards Hau Thao village where you can see people make clothes by hand and dye clothes by using indigo plant. We return by car to Sapa in the afternoon, you can have shower at the hotel before being transferred to Lao cai to catch the night train to Hanoi. You arrive in Hanoi at 05.00am. Tour finishes.